THIS. IS. IT. I’ve never fallen in love with a recipe as quickly as I did this one. 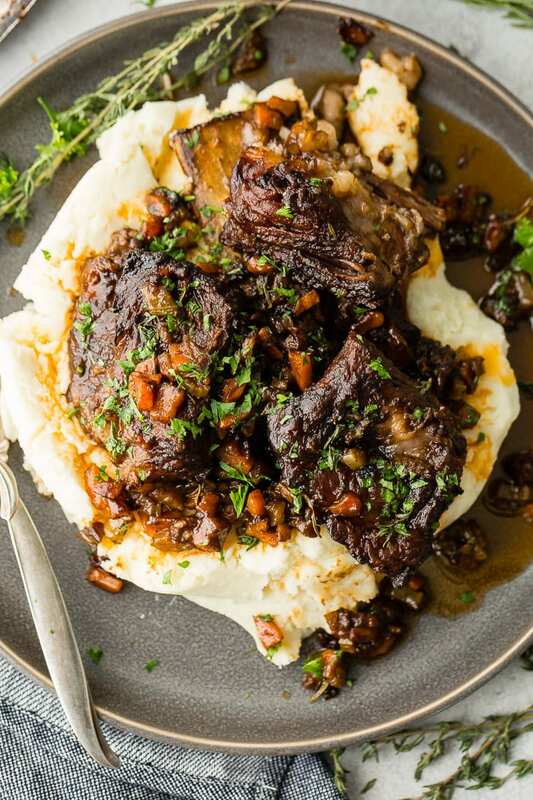 I don’t think I’ll ever love another recipe as much as Oven Braised Short Ribs! I don’t really remember eating short ribs growing up. Is it something that you grew up with? We certainly had ribs, mostly pork ribs, but not oven braised short ribs and now I feel like my childhood must have been a complete waste. Alright, not a waste, I mean my parents totally killed it for us kids. We had campouts and nights under the stars, lazy game nights and watching movies together and on and on. 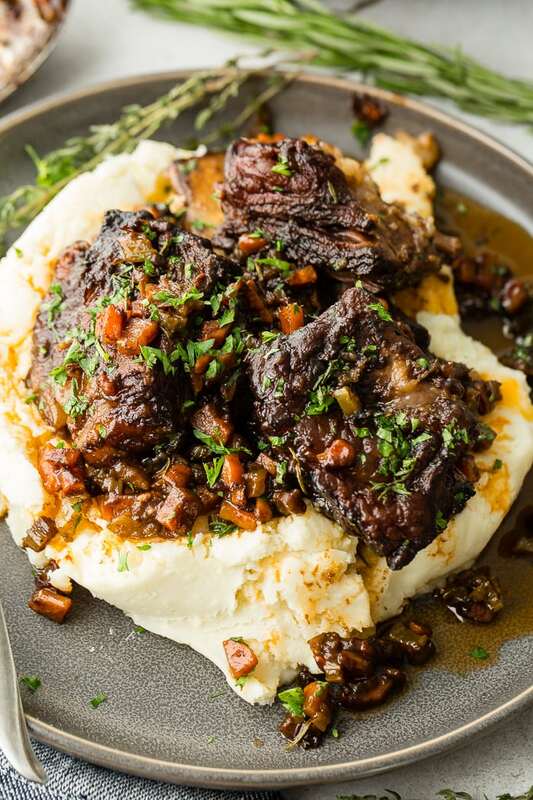 I totally had a good childhood, I just think it would have been perfection if I’d had these oven braised short ribs. 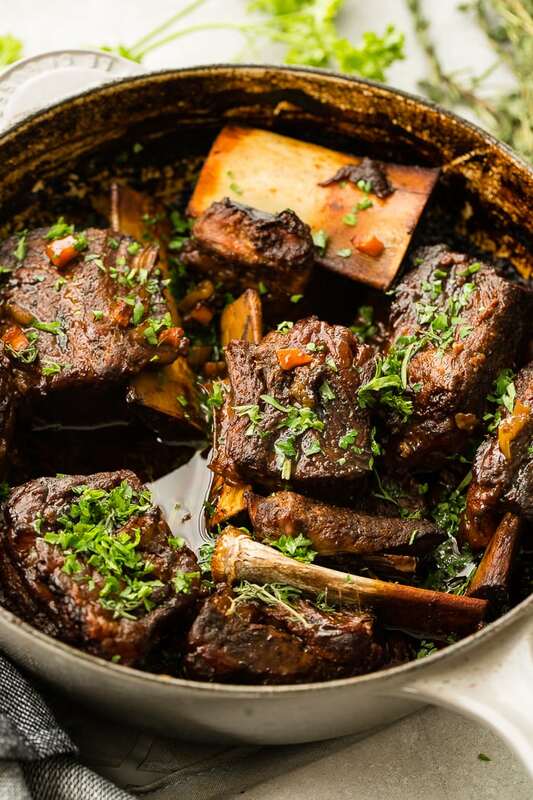 Oven braised short ribs sounds a lot more fancy than it really is, so take a deep breath and let’s do this together. It’s basically ribs that are cooked slow with liquid in a pot in the oven until they totally and completely fall off the bone. Don’t you love when that happens? When meat is so blasted tender the bone is completely clean when you try to lift the meat out. Man, that’s the good stuff right there!!! It’s so, so good! 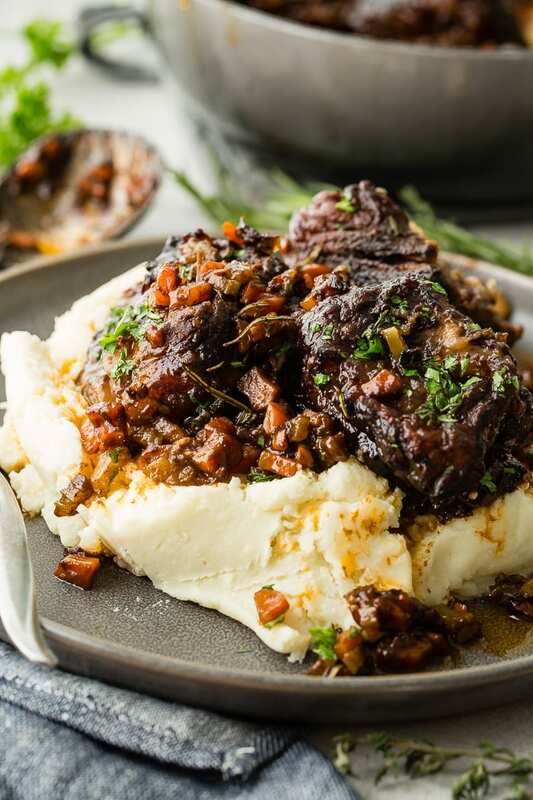 These oven braised short ribs have the most amazing flavor and gravy with them. It’s a combination of all the good stuff like carrots, onions, garlic and celery that caramelizes and melts down to give the gravy that perfect base. But then there’s the burst of flavor from the Balsamic vinegar. Mmmmmm, I think I’ve found my new favorite meal to make for when company is coming to dinner. Are Short Ribs Beef or Pork? Short ribs are all beef and are one of the most tasty ways to eat ribs. They are similar to a pork spare rib, but are meatier and thicker. Can Short Ribs be Boneless? Beef short ribs can be boneless, however we prefer bone in. They end up more flavorful and tender. When you’re at the store, look for bone-in short ribs that have already been cut up into individual ribs. You can cook short ribs a few different ways, but one of the most popular and delicious ways to cook beef short ribs is to braise them. Braising is when you begin by frying the meat in a pan, then place it in a sealed container, such as a Le Creuset dutch oven along with liquid and cook it low and slow until the meat completely falls off of the bone. Braising is basically pot stewing. Saying it that way makes it a little less complicated. Braising allows a less tender cut of beef to become unbelievably incredible. Braising is when you cook beef in enough liquid to almost cover the meat, in a sealed pot. Stewing is when you use small cuts of beef immersed in liquid, just like Beef Bourguignonne. How Many Short Ribs Per Person? Here’s the trick though, because short ribs are cut into individual ribs it can seem like you’re going to need a lot to feed your family, until you see how much meat is on each rib. At this point it’s all confusing about how much to use. If you’re serving beef short ribs to adults, it’s best to plan on 2 short ribs per person. Alright, we’ve talked about a lot, but cooking short ribs in the oven is truly the best method for fall off the bone goodness. This is because the heat is coming from all angles and the pot is completely sealed, allowing the steam and heat to really break down the fibers and fat, melting everything into perfection. What Temperature to Cook Beef Short Ribs? It’s best to cook short ribs anywhere between 350 to 375 degrees. We tend to almost always do 375. Can Short Ribs Be Over Cooked? Braising short ribs takes a long time and part of that is when the meat becomes very tough. This can be confusing as it seems like you may have overcooked the meat and it’s not too tough. This isn’t true, keep cooking the meat and it will eventually fall apart. Now, just like anything if you continue to cook it forever the liquids will all completely evaporate making the meat sit flat on the bottom of the pot. This contact will eventually lead to burned up meat. If you’re out of time and looking to cook short ribs fast you can always turn to your trusty instant pot. Here’s the thing though, that slow braise is what allows the gravy to thicken and really penetrate the meat. 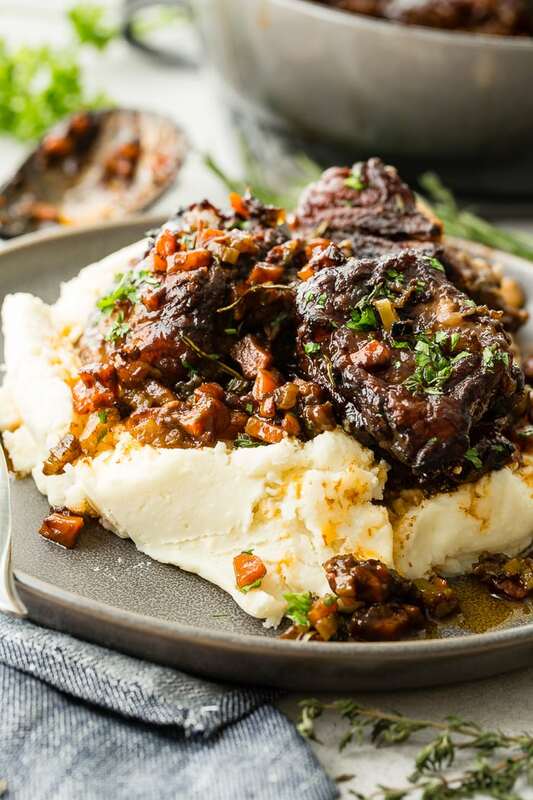 This means that I don’t necessarily recommend cooking these Oven Braised Ribs in an instant pot, but you can definitely do it. Sauté the veggies in a pan as well as brown the meat in a pan instead of the instant pot in order to get better caramelization. Place everything in the instant pot and turn the vent to seal. Press the STEW function and set the time to 50 minutes. Allow a natural release and then remove the ribs. Looking for more ribs recipes? A good teriyaki anything is so good, so make sure you try our FAMOUS Easy Asian Sticky Slow Cooker Ribs, Smoky BBQ Instant Pot Ribs, BBQ Ribs. Or if you want another classic comfort food, try this meatloaf recipe, chicken fried steak, or this pepper steak! And every meal is better with a side of the perfect dinner rolls! THIS. IS. IT. I've never fallen in love with a recipe as quickly as I did this one. 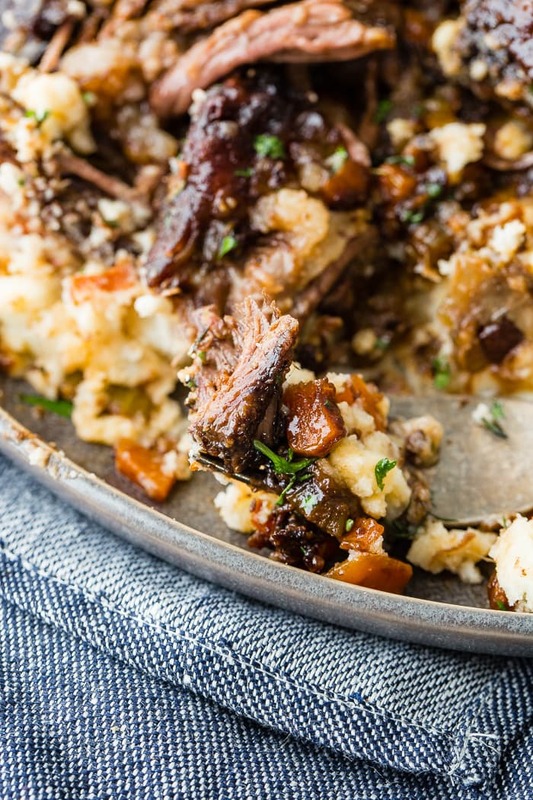 I don't think I'll ever love another recipe as much as Oven Braised Short Ribs! Place the flour, salt and pepper in a pie dish or pan. Coat each rib on all sides with the flour and set aside. Heat a dutch oven or oven safe pot over medium high heat with a few drizzles of olive oil. Add 3-4 ribs at a time, browning on each side and remove to a plate. Wipe out any black flour if there is any, leaving any browned bits in the pan. Turn the heat to medium and add the olive oil and butter. Quickly add the onions, carrots, celery and garlic, stirring to combine. Cook for 5-6 minutes or until the veggies are tender. Add the remaining flour and stir for 30 seconds. Add the vinegar, Worcestershire sauce, liquid smoke, and beef broth. Bring to a simmer. Add the herbs and bay leaves and place the short ribs back in the pot. Place the lid on the pot and cook for 2 1/2-3 hours in the oven, or until the meat is falling off of the bones and the liquid has reduced down. Remove the bay leaves and herbs and serve hot over mashed potatoes.